Dear Mosaic Family,The Christian life begins with faith. Just faith. Simply faith. Nothing but faith. However, this faith isn't simply knowing some truths or facts intellectually. Genuine saving faith is a pulsating connection to God. It's a vibrant relationship. When we truly believe in Jesus Christ, we are deeply connected to him. Scripture even talks about us being "in Christ." We are in him, and he is in us. If we're connected to Christ, we cannot but be transformed. Our life looks and feels different. We live for what he lives for. We want what he wants. We dream for what he dreams. We pray: "May your will be done, in my life, as it is in heaven." We love him and we long to please him, so Jesus says, "If you love me, you will keep my commandments." We obey, not to be accepted; in Christ, we are accepted, so we obey. In our text this week this week, Paul is invited to speak about the Gospel to a powerful politician named Felix. 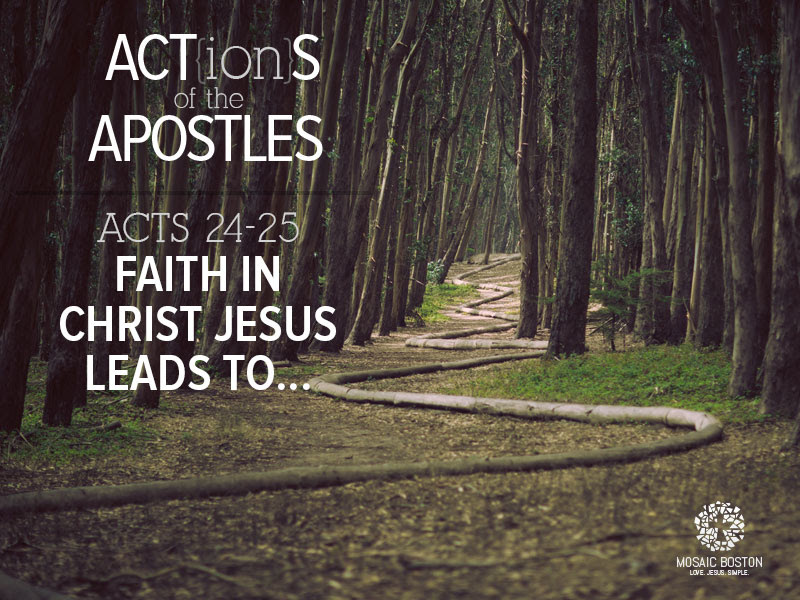 Acts 24:24-25, says Felix invited Paul and "heard him speak about faith in Christ Jesus. And as he reasoned about righteousness and self-control and the coming judgment, Felix was alarmed and said, “Go away for the present." Felix understood that if the Gospel is true, then he needs to make some massive lifestyle changes. This "alarmed him." Join us Sunday, as we hear the alarming truth. Quarterly Members' Meeting and Lunch. Saturday April, 5th. 10am-Noon ICC 30 Gordon St. Allston Are you a member of Mosaic? Make sure to mark your calendar for our next members' meeting and lunch at the ICC. We will discuss and pray about our vision and goals for the next season of church life and growth. Membership Class: Not a member of Mosaic, yet? No worries! We've got another membership class coming up on Saturday, May 31st, 9am-noon at the ICC. Attending this class is the first step to becoming an official member of Mosaic Church. Baptism Services! We've got two baptism services coming up: April 13th and April 20th (Easter Sunday!). If you have not been baptized as a believer, please let us know! Why(God)Why. We've got a phenomenal 5-week sermon series coming up, in which we'll ask and answer the biggest objections people have to Christianity. Do you have questions regarding the veracity of Christianity? Do you know anyone who is spiritually searching? Then definitely come and invite your friends! The series begins on Easter Sunday, April 20th! Pre-service Prayer: Every Sunday morning, Mosaic holds a pre-service prayer meeting at 9am. Please join us in theater #8 to pray for our church, our city, and our world!